John Callen as Oin and Peter Hambleton as Gloin. "Distant cousins of Thorin Oakenshield, these two doughty Northern Dwarves join the Company out of a sense of loyalty to their kin, and also because they have a substantial sum of money invested in the venture. Along with Bombur, Gloin is the only other married Dwarf in the Company (there being a shortage of female dwarves in general). His wife is an acclaimed beauty with a particularly fine beard. 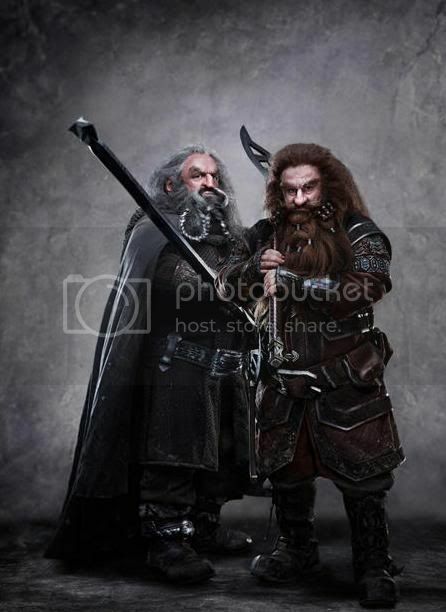 Gloin is the proud father of a young son, Gimli, who will go on to become part of the famous Fellowship of the Ring."